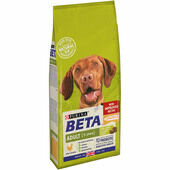 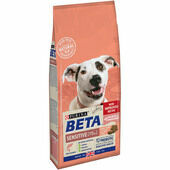 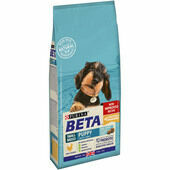 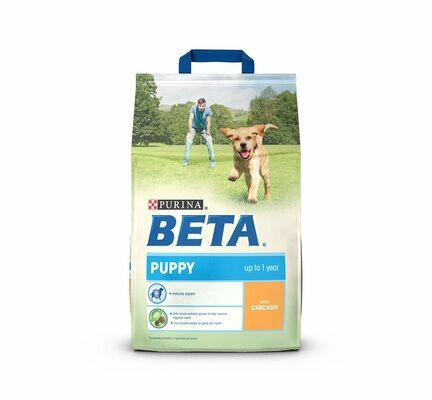 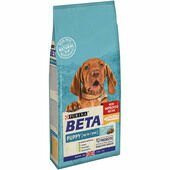 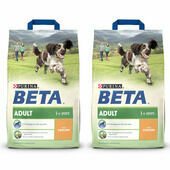 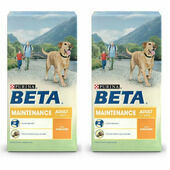 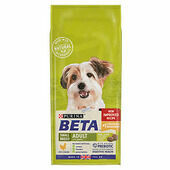 Developed for junior dogs under one year old, Beta Puppy Chicken dog food by Purina provides pets with a nutritionally balanced meal that will actively support their physical development and provide them with the energy they need to live and active, healthy life. 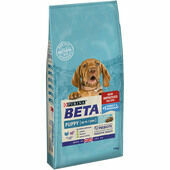 Enriched with DHA to ensure the healthy development of the brain and eyes, Purina Beta Puppy Chicken Junior Dog Food also contains natural sources of antioxidants and prebiotics, which together shall provide a much-needed boost the immune system and promote healthy digestion. Containing high levels of protein to aid with muscular development, the wide range of essential vitamins and minerals contained within Purina Beta puppy dog food will help to strengthen your pet's teeth and bones. 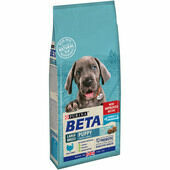 Moreover, its wonderfully textured dual-shaped kibble encourages junior dogs to chew their food thoroughly and will also help to keep teeth clean. 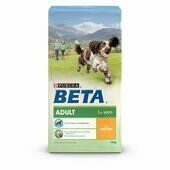 Ingredients: Cereals, meat and animal derivatives (8%), vegetable protein extracts, oils and fats, derivatives of vegetable origin, vegetables (dried chicory root 1.1%), minerals.